WWE Tribute to the Troops is an annual event held by WWE and Armed Forces Entertainment in December during the holiday season since 2003, to honor and entertain United States Armed Forces members serving in Iraq and Afghanistan. WWE performers and employees travel to these countries and interact with troops for at least three days, visiting military camps, bases and hospitals, including the Walter Reed Army Medical Center and Bethesda Naval Hospital. WWE then holds a free show for the troops, which later airs along with videos of troop interaction and messages from soldiers to their families and friends at home, in a televised program of the same title. The idea of the event is credited to wrestler John "Bradshaw" Layfield, who suggested it to WWE Chairman Vince McMahon. WWE first held the event in December 2003, from Camp Victory in Baghdad, Iraq and aired it on Christmas Day as a special episode of WWE SmackDown. In the main event, John Cena defeated Big Show, and Stone Cold Steve Austin came out after the match, hit a Stunner on both men, and finally invited all the talent backstage to the ring to celebrate. For this Tribute to the Troops and all others until 2011, commentary was recorded at WWE headquarters in Stamford, Connecticut, as commentators were not at ringside. In December 2004, WWE traveled to COB Speicher in Tikrit, Iraq. The TV show, Christmas in Iraq, aired on December 23 as another special SmackDown episode. Eddie Guerrero and Rey Mysterio defeated Kurt Angle and Luther Reigns in the main event. 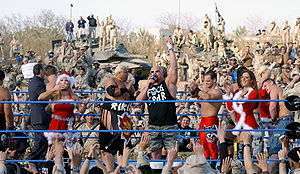 On December 9, 2005, WWE held the event at the Bagram Airfield in Bagram, Afghanistan. It aired December 19 on WWE Raw. In the main event, Shawn Michaels beat Triple H in a Boot Camp match. In 2006, the show was taped at Camp Victory in Baghdad, aired on Raw on Christmas Day, and had Carlito pin Randy Orton in the main event. A day before taping, a mortar attack happened near the camp, injuring 14 soldiers. Michael Cole reported details from the scene minutes later. In 2007, WWE returned to Tikrit. D-Generation X members Triple H and Shawn Michaels defeated Umaga and Mr. Kennedy in the main event, which aired on Christmas Eve on WWE Raw. 2008's show from Camp Liberty, Baghdad was the first to air in a non-standard WWE timeslot, a one-hour December 20 special on NBC. In its main event, John Cena, Batista and Rey Mysterio defeated Chris Jericho, The Big Show and Randy Orton in a six-man tag team match. WWE again travelled to Iraq in 2009. In the main event from Joint Base Balad, John Cena retained his WWE Championship from Chris Jericho. It aired on December 19, 2009 on NBC. In 2010, WWE held its first domestically hosted Tribute to the Troops, from Fort Hood in Killeen, Texas on December 11. It aired on NBC December 18 for one hour, with a message from former president George W. Bush. A two-hour version of the show aired December 22 on USA Network. In 2004, the United Service Organizations (USO) of Metropolitan Washington awarded WWE with the first-ever Legacy of Hope award "for its extensive support of our troops and the USO's Operation Care Package program". In 2005, the Army and Air Force Exchange Service awarded WWE the first-ever Three-Commander Coin Award "for WWE's support of its partnership with AAFES to improve the quality of life for our troops by supporting service members and their families worldwide". During the 2006 show, Director of Air Force Morale, Welfare and Recreation Art Myers presented WWE Chairman Vince McMahon with the Secretary of Defense Exceptional Public Service Award. McMahon immediately presented the award to John Bradshaw Layfield, who had the idea for the show. In 2007, the WWE received the first Corporate Patriot Award at the annual GI Film Festival in Washington, D.C., "in recognition of its ongoing support and appreciation of the U.S. military and their families, particularly its annual holiday Tribute to the Troops tour to entertain troops in war zones in Iraq and Afghanistan". In 2008, then President George W. Bush aired a message during the show, thanking WWE for giving US troops the gift of entertainment every Christmas. He did so again in 2010. 1 2 3 4 5 "About WWE's Support of Our Troops...". WWE. Retrieved 2009-01-24. 1 2 3 4 5 6 Cawthon, Graham. "Tribute to the Troops results". Retrieved 2009-01-24. ↑ "WWE: TV Shows > Raw > Tribute to the Troops 2005". WWE. Retrieved 2009-01-24. ↑ "WWE: TV Shows > Raw > Tribute to the Troops 2006". WWE. Retrieved 2009-01-24. ↑ "WWE: TV Shows > Raw > Tribute to the Troops 2007". WWE. Retrieved 2009-01-24. ↑ "WWE: TV Shows > Raw > Tribute to the Troops 2008". WWE. Retrieved 2009-01-24. ↑ Clayton, Corey (2009-11-11). "Tribute to the Troops airs Dec. 19 on NBC". WWE Universe. Archived from the original on November 14, 2009. Retrieved 2009-11-13. ↑ K, T (2010-11-07). "Tribute to the Troops airs Dec. 18 on NBC". WWE Universe. Retrieved 2010-11-07. ↑ Cole, Michael. "WWE: TV Shows > Raw > Tribute to the Troops 2007". WWE. Retrieved 2009-01-24.